The Visitation of Mary to Elizabeth. and amplify the proclamation of your glory. with a shout of joy and victory. that maintain my life and my spirit. joining the chorus of generations in praise. that my life may testify to the power of the Holy One. and fill the hungry with good things. and scatter the schemes of the powerful. and call them to justice. we appeal to You in trust and faith as we pray. and hear our chorus of praise. to give praise to the Creator, Holy and Loving! O Spirit of Healing and Peace. and our mouths to praise and faithfulness. that we may proclaim the Truth of God in all things. and for the beauty of loving hearts in the world. whose love and support strengthens us each day. which inspires us to love and care for this Earth. at sleep or at work or at play. to serve and worship You with all that we have. 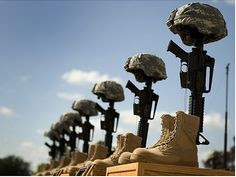 those lost in defense of hearth and home. Accept the whispered supplications of your people, O Holy One, and scatter the blessings of your love and tenderness upon those we now name. and lay our thanksgivings and prayers at your feet. and call us to love, honor, wisdom, and service. even in our own hearts. honoring the human dignity of all persons. which is your commandment, O God, from time immemorial. for the sake of those who need our help. who espouse violence, hatred, inequality, or tyranny. 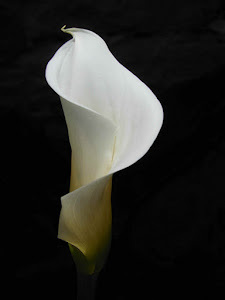 comfort those who mourn, and those who remember. and lift up those we now name. I spent the first thirteen years of my professional life teaching middle school English, and one of the most basic things with which many of my students struggled was what was known as “subject-verb agreement.” You know: if you have a singular noun, you use a singular form of the verb attached to it, and if you have a plural noun, you use the plural form of the verb attached to it. This should be simple—but in English there are always exceptions. One of those exceptions is this: there are some nouns that remain the same word, whether singular or plural. Like “moose.” Or “bison.” Or “news.” Or “shrimp”—unless you are British. With these words, we have to think hard about whether we use “is” or “are” for instance, because we only know if they are singular or plural based on the context. In Christianity, “Trinity” is another one of those words. 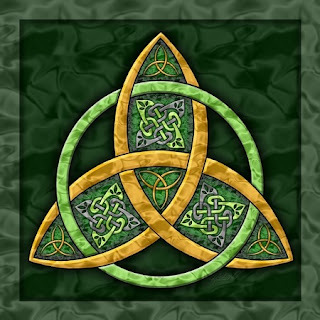 Sometimes we speak of the Trinity in the singular, as a unity. 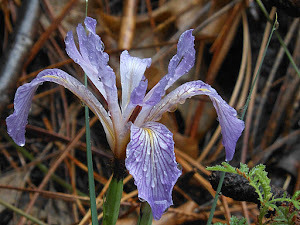 Sometimes we speak of the Trinity in the plural, as three distinct “persons” or “aspects.” But the problem is, no matter how we try to speak about the Trinity, we run into the danger of limiting the relationship within the Trinity in ways that make one aspect dominant over the others, instead of “one in being,” as we say in the words of the Nicene Creed. It’s not made any easier by the fact that, while various terms for the Father, the Son, and the Holy Spirit are all mentioned in scripture, the term “Trinity” itself does not appear anywhere in most modern translations of either the Old or New Testaments. 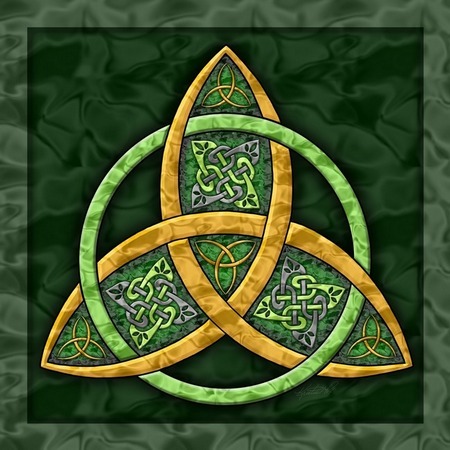 And yet each one of our readings can be seen as describing aspects of the Trinity. The Spirit of God calls to Isaiah and we hear both the singular and the plural in that call: “Whom shall I send? And who will go for us?” And Isaiah plucks up the courage to answer even as the vision he sees overwhelms him. In Romans chapter 8, Christ is described as the one who reconciles us to God, the Spirit leads us and bears witness within us, and the Father adopts us as children. All three aspects work together to redeem us and restore us to proper relationship as beloved children of God. Jesus’s conversation with Nicodemus depicts the Jesus the Son talking about both God the Father and the Holy Spirit coordinating in the work of salvation—and just like us, Nicodemus probably emerged from that conversation more confused than ever. This encounter between Nicodemus and Jesus reminds us that too often, we are more like Nicodemus than we realize—we may think we have God all figured out, only to find that God upends our comfortable certainties with endless and therefore discomfiting possibilities. Even saints tread carefully around trying to define the Trinity, and most agree it is far safer to talk about what the Trinity is NOT, rather than what the Trinity IS. It is at this point that I have to tell you how excited I am that we have a visual aid for this right here in the rose window behind me, made by the good people of Emil Frei associates, my favorite stained glass artists. This does not always happen in such a convenient manner for a preacher, let me tell you. Have you ever looked at this window? Do you see what’s going on here? I am certainly no scholar of Latin, but you can see an example of that kind of negative explanation of the Trinity right there in the window behind me, visually representing the Trinitarian formula of blessing. The Father is NOT (that’s what “non est” means) the Spirit, the Spirit is NOT the Son, and the Son is NOT the Father. 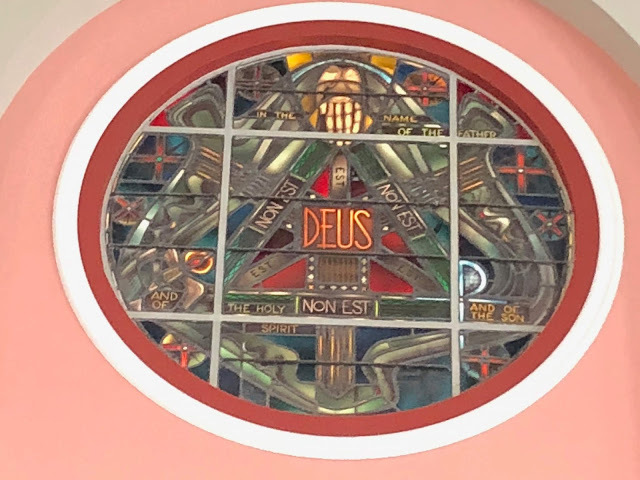 Yet all three are connected at the center to make up God—Deus, in Latin. Thus, the Father IS God; the Holy Spirit IS God; and the Son IS God. Together. All different, yet all working together actively and equally in creation as God. And God is at the very center, so that as we look at this image, we are reminded that we are drawn by love into God’s very existence, the existence that is the center and gift of our own lives. 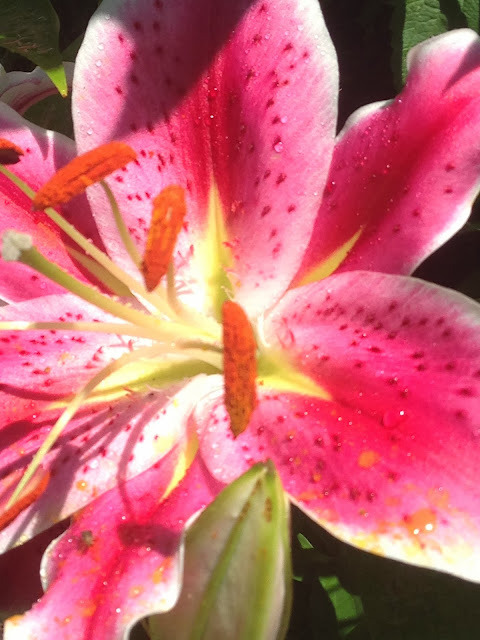 Because language is limited and we are finite creatures, we speak imperfectly about God. St. Irenaeus, one of the so-called Fathers of the Church, argued against heresy that the “persons” of the Trinity were not equal partners, and that the God of the Old Testament was different from and inferior to the God described in the New Testament. One of the most famous metaphors Irenaeus used to talk about proof of the Trinity throughout scripture was based upon the statement in Genesis 1:26, where God says “Let US make humankind in OUR image, in OUR likeness…” Following the argument of St. Justin, Irenaeus argued that the use of the plural “us” showed evidence of the Son and the Spirit in God’s own voice. I like to think of that even more specifically: God the Father is the ground of our being, and the Son and Holy Spirit are like embracing arms that draw us into union with God and with each other. Yet I admit that this is just one image, and that for all its beauty it is still too limited to express the full glory of God. The doctrine of the Trinity, as difficult to define as it is, nonetheless teaches us some valuable truths. 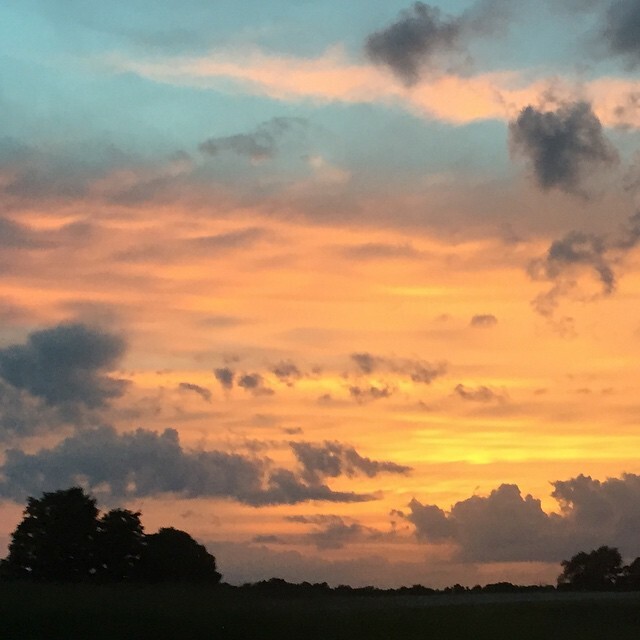 First, that no matter what, as Nicodemus was reminded, we can never rest on our own reasoning or knowledge to know God—God is a beautiful mystery, yet at the same time absolutely a loving, involved presence in each of our lives. Second, the doctrine of the Trinity teaches us that relationship in community is at the heart of the life of faithfulness. We know God through God’s initiative, not ours, because God’s very being is love. Whenever we seek out God in prayer, in worship, in joy, in anxiety, in sorrow, God invites us into relationship. God as Trinity declares that God is, by nature, relational: Father, Son, Holy Spirit, as we hear in our Book of Common Prayer. Earth-maker, Pain-bearer, Life-Giver, in the words of the New Zealand Prayer Book. Creator, Redeemer, and Sanctifier. No matter the terms we use, they can only partially express the active love of God in our lives. 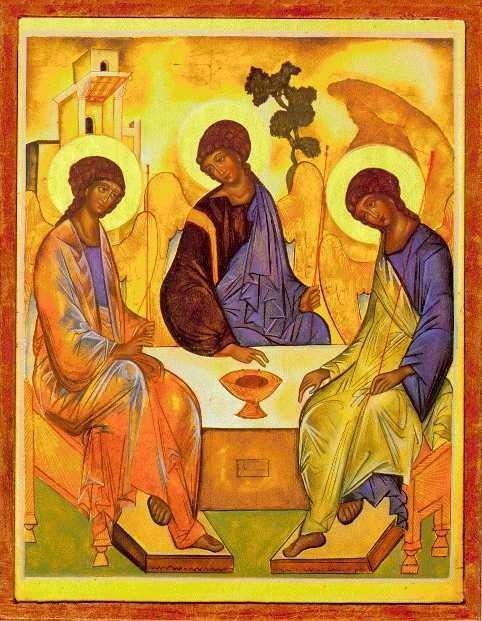 The three “persons” of the Trinity nonetheless are mysteriously but ultimately one, bound together in what can only be described as a dance of love into which we, as God’s beloved children, are invited, even if we ourselves think we only have two left feet. 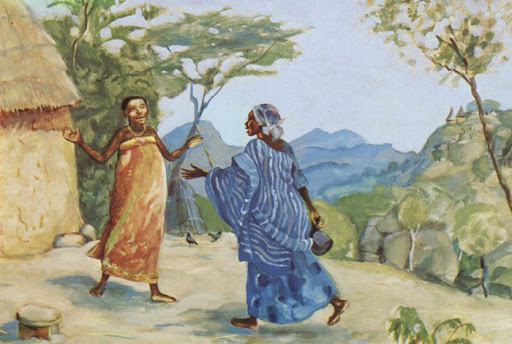 Yet we are made to dance, because if we are created in God’s image, that means we are created also to be fully who God created us to be only when we too live in community and communion with others. We are thus reminded that relationship is at the heart of being Christian. This is tonic in a society in which so many people feel isolated, marginalized, and beseiged, a society in which we see a marked tendency by many to define themselves against those who are different from "us." But that is contrary to the very nature of God. The fellowship of love at the heart of God, and to which we are called, is not limited by the walls of this building, nor by race, nor by flag, nor by nationality. The fellowship to which we are called by God’s love is a fellowship with all creation. 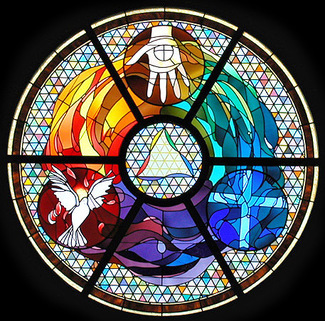 The Trinity is a celebration of interdependence, a true unity in diversity. What could be a more necessary miracle in this day and age? Relationship is at the heart of who God is: pure love, as the first letter of John has been reminding us throughout the Great Season of Easter. Fierce, active, enduring, limitless love-- that is the foundation of fellowship, of communion with God, and with each other. In the words of Orthodox theologian John Zizioulas, “the being of God is a relational being; without the concept of communion it would not be possible to speak of the being of God.”(3) That word “communion” is important, for the eucharistically-shaped life we commit to in the Episcopal Church is one of the most obvious ways we ourselves are invited into the relationship of the Trinity. Through communion and thanksgiving, through God’s grace and invitation, the divine circle of love is expanded even more dramatically, to include all creation through each and every one of us gathered around this altar. Listen! Soon you and I, all of us together, will ask the Father to accept our gifts of bread and wine, taken from this good earth. We will ask the Father that the Holy Spirit be present to us to sanctify those gifts and us, making Christ present to us, here and now. It is only through the loving activity of the Trinity, acknowledged in our Eucharistic prayer, that we may receive the Body and Blood of our Lord Jesus Christ, that we may be present and one with him-- and one with each other. We are not called to this sacrament only for ourselves, but rather so that we can be strengthened to go out into the world as participants in God’s reconciliation and redemption in the world. We take our place within the embrace of the Trinity through ourselves cultivating real love—love that doesn’t count the cost, but rejoices in the beloved. Love that is the basis of ongoing creation—since God creates us through a desire for relationship with us, and that then draws us to share that love with all that is. 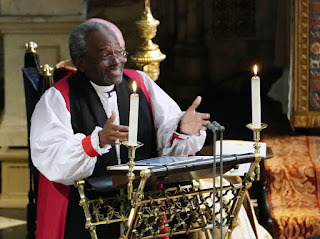 It is only this divine love which we wonder at in the Trinity that can satisfy the hunger for meaning that plagues this time in which we live—and just look at the response to Presiding Bishop Curry’s sermon at the royal wedding to see how deep that hunger runs in the world. 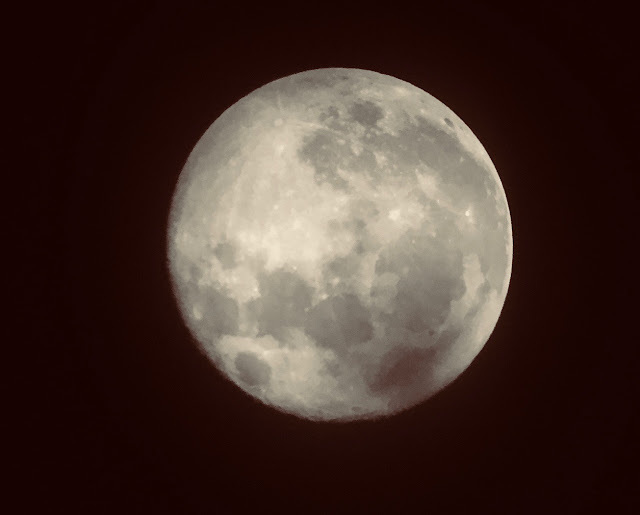 I am convinced that the doctrine of the Trinity, when taken seriously, reminds us to be and remain humble, and to admit that we need to never lose our sense of wonder, of awe, of mystery—a real challenge and yet opportunity in our blasé, cynical world. We can rediscover that sense of wonder, awe, and mystery each and every time we gather together with our hands upraised and hearts open to partake in Christ’s Body and Blood, given for us so that we may then carry and reflect that love into the world for the sake of the world. 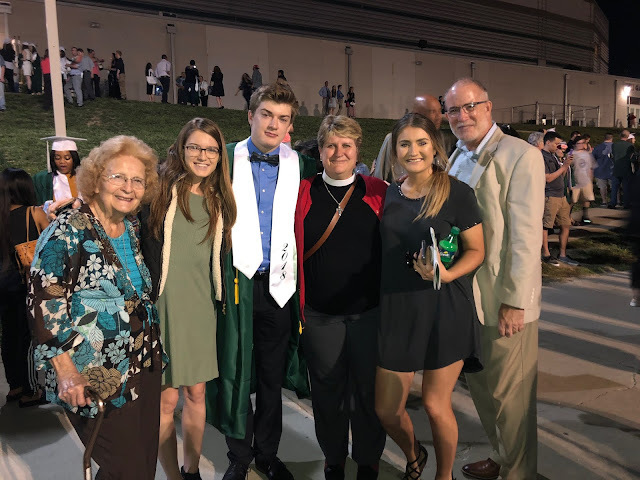 Preached at 8:00 and 10:00 am at Christ Episcopal Church, Rolla, on May 27, 2018. 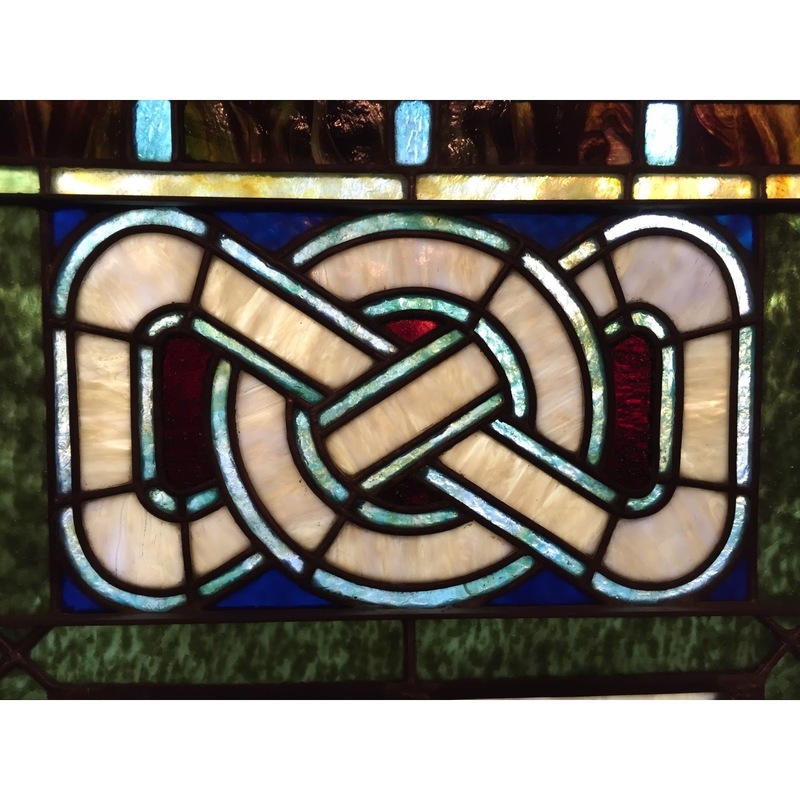 (2) Trinity window from Emmanuel Episcopal Church, Webster Groves, MO. Photo mine. (3) Trinity rose window at Christ Episcopal Church, Rolla, MO. Photo mine. (5) Sweet Olivia at the communion rail. Photo mine. who holds all our days in your keeping. and bring us to new life in You. and that is heaven on Earth. of using others for our benefit. that we may proclaim your glory to the world. as we lay our concerns at your altar. 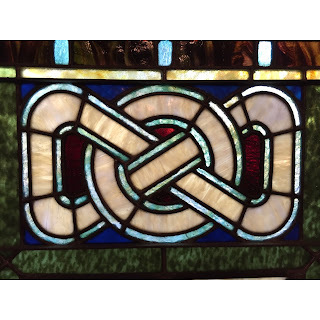 Photo: Trinity Window at Christ Church Cathedral, St. Louis, MO. and prosper our witness to your wondrous deeds and power. the Incarnate Word who shows us how to live. and answer and bless those whose whispered prayers we lift before You. rejoicing in your unfailing care of us. putting our shoulders to the wheel of reconciliation and hope. what we may live within the peace of God in every moment. and work for true justice for all we meet. and bless all who call upon your Name as we pray. renewing our hearts and spirits in hope. of true justice, abundant mercy, and steadfast peace. taking up your yoke of love with joy. your grace which knows no end. and place your healing hand upon all for whom we pray. for your love has watched over us through the night. that we may turn aside from evil and embrace good. and serve each other in love and joy. and the face of Christ in each person we meet. and remember that we are your hands in the world. and make your face shine upon those we now name. the song of joy You taught us even before our birth. and great is your grace and mercy and power. following in your footsteps with integrity and gentleness. honoring each other as children of God. especially those whose needs we now lift before You. and gather together in prayer and and faithfulness. and serve each other with grateful and humble hearts. to your wisdom and truth. and grant your blessing and protection to those we remember before You. Unless you have been on silent retreat for the last week, you have probably heard that the Presiding Bishop of the Episcopal Church, the Most Rev. Michael Curry, was chosen to preach at the royal wedding of Prince Harry and his American bride, Meghan Markle. Upon hearing the news last week, those Episcopalians who have been blessed to hear this man of God preach reacted with what was, especially for we staid Episcopalians, outright glee. However, those of us who have to try to preach after that amazing sermon know also experienced a slight feeling of dread at the thought of stepping into a pulpit after an amazing message like that. Sure, there was the frustrating side: trying to explain the proper usage of the word “Episcopal” (an adjective describing an institution) and “Episcopalian” (a stand-alone noun for a person, not a church), that the style to address him is “The Most Rev.” and not just “Reverend.” Then there was the amusement of watching every single place he has ever lived claim him as its own—Chicago, New York, North Carolina—all those newspapers looking for that precious local angle. And if you were able to hear his sermon, you know that he did not disappoint. If you have not heard his sermon, even if royal weddings are not your thing, I highly recommend you listen to it, or any of his other sermons available on Youtube. Bishop Curry’s preaching is rightfully described as “Spirit-filled.” And yesterday, the world got a taste of it, thanks be to God. His preaching proclaims the gospel boldly in ways that capture the imagination even of those who are unacquainted with religious faith. Consider this: in a nation like the UK, where only 28% of the population expresses a belief in God, his amazing 13-minute sermon about the power of love had not just that nation but the world betraying the same kind of amazement and wonder we saw in our reading from Acts this morning. Yet of the three “persons” of the Trinity, the Spirit is probably the one we talk about the least, especially we Episcopalians. Something about the Holy Spirit seems… intangible. God the Creator, we get. Jesus Christ the incarnate Son of God, a description which boggles the mind, we even get, because he was one of us, fully human. But the Spirit is a puzzle or a bewilderment. Maybe it has to do with other names for the Spirit, which include Holy Ghost; Advocate; Helper; Breath of God; Giver of Life or Life-Giver; or Paraclete. Yet the Church itself would not exist without the Spirit, as we see in the words of the Nicene Creed, where discussion of the “Holy, catholic, and apostolic Church” is placed in the section on the Holy Spirit. We always need to remember that the Church was founded after Jesus’s earthly life had ended, not before, becoming the Body of Christ in the world. 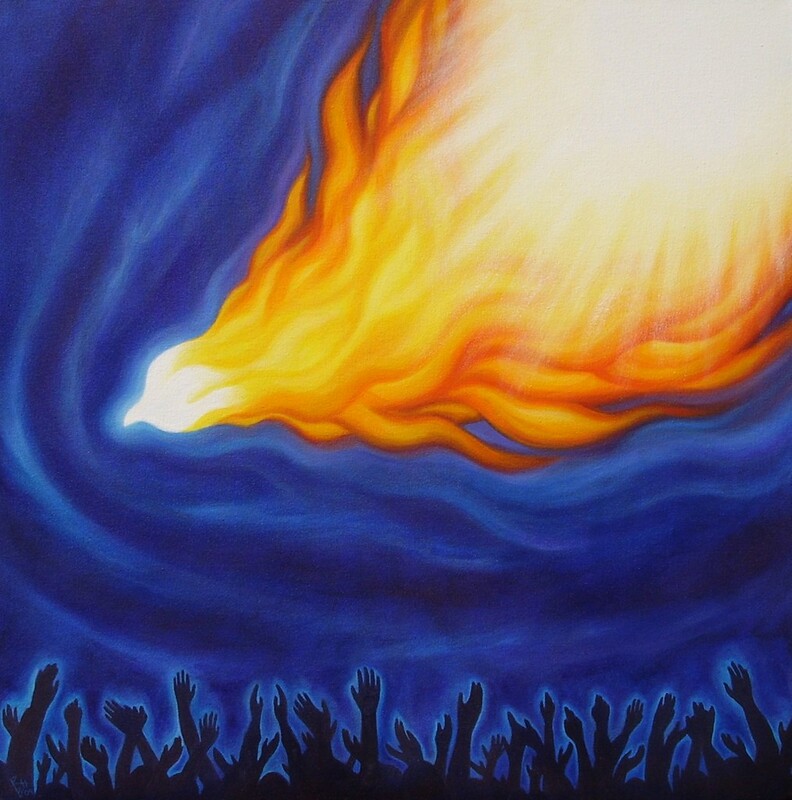 Today, the Day of Pentecost, is the day we celebrate and remember the Holy Spirit coming to consecrate and commission the Church to proclaim the gospel to the ends of the Earth. In his book, Crazy Christians: A Call to Follow Jesus, Bishop Curry spoke of Pentecost Day as a day of the power of collaboration and community, when the power of the Holy Spirit seized each one of those disciples and made it possible for the gospel of Jesus, the gospel of the power of love, to be heard and understood by all people—to abide in all people as a living presence. Bishop Curry wrote, “The story of Pentecost… speaks of barriers being bridged and divisions being overcome. 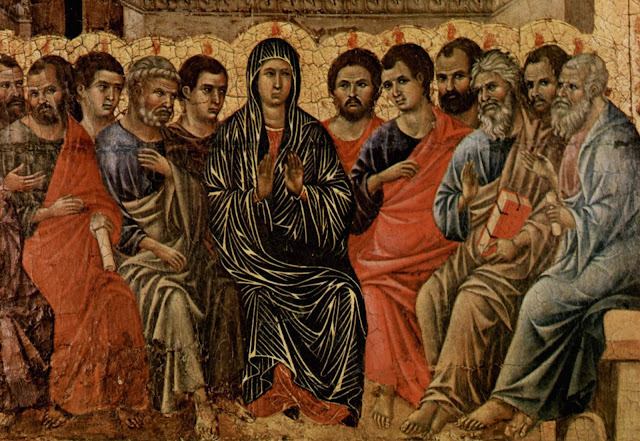 On Pentecost, people heard the gospel of Jesus. And as they heard the gospel, barriers came tumbling down, bridges arose, and the new humanity in Christ began to emerge. "(1) It is clear that when that Spirit is present and abiding in a community, barriers and divisions are broken, and bridges and community is built and made strong through planting within us the love of Jesus Christ, who scorns no one who seeks him, but instead embraces them regardless of any category we might us to differentiate one person from another. The gospel of Jesus is meant to bring us together. It is never to be used to divide, to hurt, or to wound another. 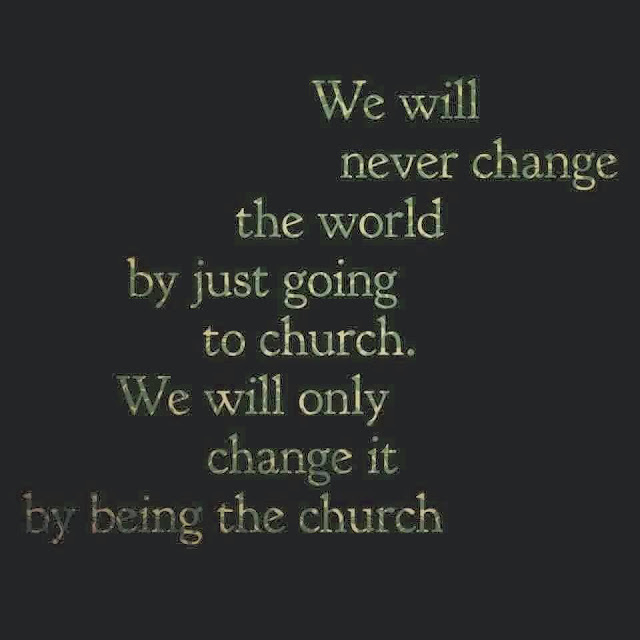 Rather, through the power of the Holy Spirit, we abide in each other, we abide in truth and integrity, we abide in God. In another of his books, Following the Way of Jesus, Bishop Curry recalls the words of an illustrious former archbishop of Canterbury, William Temple, who served for far too short a time during World War II. Archbishop Temple once said that telling anyone to live like Jesus is useless. We fallible fallen people can’t do it. EXCEPT through the power of the Spirit of Christ. Bishop Curry then continued, “When the Spirit that lived so fully in Jesus inhabits us, then we have a chance to live like him. That’s precisely what happened to the early followers of Jesus’s way. They began to look like Jesus. Folk in Antioch saw them and nicknamed them 'little Christs. '”(2) And they, and we, are able to look and act like Jesus, flawed and hesitant as we all sometimes are, through the power of the Holy Spirit that we remember especially on this Pentecost Day. The same Spirit who moved over the waters at creation, as our psalm reminds us: You send forth your Spirit, and all things are created; and so you renew the face of the earth. The Spirit who breathed life into all living things, and into all humanity at the birth of humanity. The same Spirit who is still active in creation, as our psalm reminds us in the present tense as well as the past. The same Spirit that descended upon Jesus as he arose from the waters of baptism to begin his earthly ministry of making God’s Love visible in human form. That then filled him with the power to speak words of healing, justice, and redemption into the most bereaved and wounded places that still exist in people throughout the centuries—all by the power of the Holy Spirit. 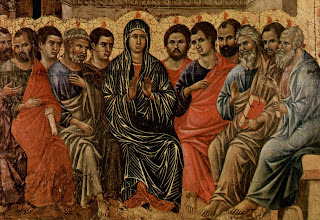 And as we saw in our reading from Acts today, that same Holy Spirit was able to transform Peter from a faithless companion who would not even admit to knowing Jesus on the night of Jesus’s arrest, to a fearless preacher driven out into the street and boldly proclaiming in the open air the full truth of Christ’s life without any concern for the consequences. In our gospel today, Jesus refers to the Holy Spirit as the Advocate, and Paul reminds us of this also. The same Spirit who alights upon Jesus’s disciples is the one that intercedes for us, helping us in our weakness, our faithlessness and even despair, we hear in the Epistle to the Romans. The Spirit who hovers over us with her regenerative, healing presence when we are so troubled we don’t even know how to pray, as Paul assured the newborn church in Rome. But that Spirit is more than an Advocate. It is the living presence of Christ within our hearts, the embodiment of the love and grace of God that seeks to claim us and renew us, body and soul. While during much of his earthly ministry Jesus directs his attention toward his own people, with some notable exceptions, when the Spirit empowers the disciples, the first thing we see is that the Spirit equips them to take their message beyond the boundaries of Jerusalem. Once those disciples pour out into the streets with their tongues of fire, we see the Spirit do something very interesting: it gives each disciple the ability to speak in a different language. In doing this, the Spirit reminds us that diversity, not uniformity, is a strength, even a gift from God. And that’s a reminder we could all use today. Reminding us that, no matter what language we speak, in Christ we speak of love, redemption, and transformation not just of ourselves but of the whole world. It is the Spirit who draws us together as the Beloved Community, a community that is consecrated and charged by the Spirit to offer ourselves, souls and bodies, as witnesses and embodiments of God’s mercy, truth, and grace for the life of the world. Come Holy Spirit, kindle the holy fire of love within us, and lead us into deeper wisdom and faith, that we may dedicate our lives to God. May we embrace the power of the Holy Spirit to reveal the truth of God’s love and grace in our lives, and go out into the world like those disciples, our hair on fire, rejoicing as we proclaim the wonders of God: Father, Son, and Holy Spirit. Preached at Calvary Episcopal Church, Louisiana, MO, at 10 am, and St. John's Episcopal Church, Eolia, MO, at 2 pm, on May 20, 2018. (1) The Most Rev. Michael B. Curry, Crazy Christians: A Call to Follow Jesus, 2013, Kindle locations 846-848. (2) The Most Rev. Michael B. Curry, Following the Way of Jesus: Volume 6 in the Church’s Teachings for a Changing World series, 2017, chapter 1, location 143 of 1178. Almighty God, You give us a Spirit of Wisdom, Power, Healing, & Truth: guide and inspire us by your Spirit in all we do. May we as your people sing out the glory of your Name and all your wondrous works, and give thanks for the bounty you provide. 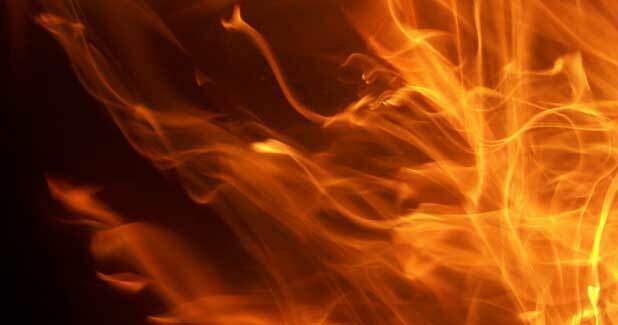 Enflame us by your Love, that our lives may be a testimony to your saving power and abundant grace. Let us always turn to your Advocate and seek to be led by Holy Wisdom, that we may be open and forthright in all we do. Knit us together in faithfulness, that we may be able to speak the Truth and live the Love for which all hearts thirst. Strengthen your faithful people to be your hands, heart, and hope in the world, to bring your good news to the wide world. By your Spirit, bestow your grace, blessing, and benediction upon those for whom we pray.